As hard as it is to imagine, digital television began around 1990 and has pretty much pushed analog out of the picture by today. In fact, it’s a little hard to imagine what television was like without all the digital tools and standards that we have today. One of the important companies in the history of digital television was General Instruments, which was one of the primary organizations working on digital video compression standards. Deeply involved in the cable TV industry, GI provided modulators, amplifiers and conditional access products for cable distribution. Marc Tayer was working for GI in 1989 when he was told by his division president that he had a new job—to bring GI’s new digital TV technology out of its R&D labs and turn it into a business. He remained involved in the digital TV business as it evolved over the next 25 years, including the broadband Internet phase. Along the way, he had many different positions at GI/Motorola, mostly in business development and marketing. Tayer recently published a book on the history of digital television, titled “Televisionaries: Inside the Chaos and Innovation of the Digital Revolution.” HDMI Encoder Modulator,16in1 Digital Headend,HD RF Modulator at Soukacatv.com BE Extra: What motivated you to write this book? 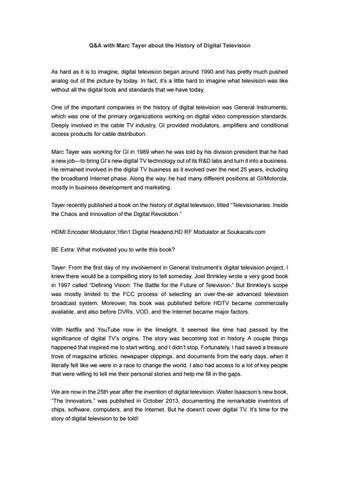 Tayer: From the first day of my involvement in General Instrument’s digital television project, I knew there would be a compelling story to tell someday. Joel Brinkley wrote a very good book in 1997 called “Defining Vision: The Battle for the Future of Television.” But Brinkley’s scope was mostly limited to the FCC process of selecting an over-the-air advanced television broadcast system. Moreover, his book was published before HDTV became commercially available, and also before DVRs, VOD, and the Internet became major factors. With Netflix and YouTube now in the limelight, it seemed like time had passed by the significance of digital TV’s origins. The story was becoming lost in history. A couple things happened that inspired me to start writing, and I didn’t stop. Fortunately, I had saved a treasure trove of magazine articles, newspaper clippings, and documents from the early days, when it literally felt like we were in a race to change the world. I also had access to a lot of key people that were willing to tell me their personal stories and help me fill in the gaps. We are now in the 25th year after the invention of digital television. Walter Isaacson’s new book, “The Innovators,” was published in October 2013, documenting the remarkable inventors of chips, software, computers, and the Internet. But he doesn’t cover digital TV. It’s time for the story of digital television to be told! BE Extra: Where is the industry going? Tayer: We are living through the most confusing and exciting period ever for the television business. It is unfolding before our eyes. Consumers are being inundated with an overwhelming choice of new technologies and services. Important topics like cord cutting, net neutrality, a la carte content, and 4K Ultra HD are constantly in the news. It is impossible to understand how everything fits together without the context and framework of where it all came from. The mission of “Televisionaries” is to connect and convey the history and dynamics of these myriad factors in a comprehensive, entertaining, and comprehensible narrative. BE Extra: Back in 1990, what were a couple of the difficult technical challenges that needed to be overcome to create a digital television standard? How were they solved? Tayer: For the FCC, over-the-air advanced broadcast standard, by far the most difficult hurdle was compressing the digital video information to such an extent that it could fit within the broadcasters’ 6 MHz UHF channels. GI developed some very advanced video compression algorithms to achieve this, some of which were later adopted by the MPEG-2 video standard. 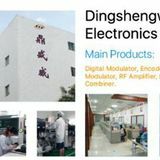 The use of concatenated forward error correction coding was another key area of innovation, enabling better signal-to-noise performance through RF channels. For GI’s digital standard-definition system, used by content providers such as HBO and ESPN, and by cable operators such as TCI and Comcast, we had to develop a complete end-to-end system, including not only digital video and audio but also digital transmission, conditional access and encryption, and service information. One of GI’s core competencies was systems engineering, but it was nonetheless an enormous challenge to ensure that all the system components played well together in an integrated fashion for seamless delivery to the subscriber. BE Extra: Looking back at the work done 25 years ago, what is something that was done absolutely the right way? And was there anything that the team worked hard on that turned out to not be necessary or was otherwise a dead end? Tayer: GI’s basic idea of designing a highly asymmetric video compression solution has proven the test of time, including with the current-generation coding standards such as H.264 (MPEG4 AVC) and most recently HEVC. This architectural philosophy, while revolutionary at the time, ensured that encoders could become increasingly complex (and therefore more bandwidth efficient) over time, while the high-volume decoder would remain relatively simple and inexpensive to implement in silicon. There really were not any significant “throwaway” wasted efforts. In virtually every area, it was the beginning of a continual evolution of improvements, even to this day with Ultra HD video, adaptive bitrate streaming, and transmission methods such as DVB-S2 and COFDM. As hard as it is to imagine, digital television began around 1990 and has pretty much pushed analog out of the picture by today.